Emery Manville Hamilton was born 22 January, 1838, in Alfred, Allegany County, New York. He was the second child in the family of Horace Green Hamilton (15 Feb 1810-24 Mar 1896) and Catherine M. Burdick (26 Dec 1818-5 May 1896). Emery had an elder sister, Mary Lavantia (b. 1836), a younger brother, Arthur (b. 1842), and two younger sisters, Madelia (b. 1846) and Madeline Lucy (b. 1849). Horace Green Hamilton (a family of Scotch descent, early settlers of Allegany County, N.Y.) was a farmer, carpenter and builder born in Brookfield, Madison Co., N.Y. On Sept. 25, 1834, he married in Alfred, Allegany Co. to Catherine M. Burdick. In 1842 the family resolved to try his fortune in the West and emigrated to the territory of Wisconsin, settling in Rock County, purchasing a farm in the town of Lima, then a part of Milton. Besides the farm, Horace worked as a carpenter and joiner and filled various local offices, including that of Assessor, Deputy Provost Marshal and Justice of the Peace. In April, 1861, at the age of 23, together with his brother Arthur, Emery joined the United States Army as a volunteer. Unfortunately, Arthur was killed at the battle of Antietam Sept. 17, 1862. Emery survived, and in 1863 he was promoted to a major in the 1st Regiment Engineers Corps d'Afrique. Hamilton would be known as "Major Hamilton of New York" for the rest of his life. It is unknown what kind of education got Emery Hamilton, but in the US census of 1880 he was listed as a mining engineer. Evidence of his engineering work exists even today. One of the names for the Stony Pass trail in Colorado is Hamilton Pass. It is named after Major E.M. Hamilton, who built a wagon road along the route in 1872. It seems Emery Hamilton was a brilliant engineer. Besides his calculating machine (see adding machine of Emery Hamilton), he was a holder of over 20 patents for typewriters, telegraph equipment (sounder, transmitter and receiver), perspective diagram-sheet, apparatus for recording measurements of time, etc. His Hamilton Automatic (see the upper image) is considered one of the masterpieces of 19th century American typewriter manufacturing. 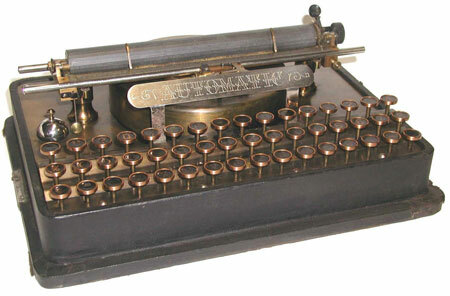 The Automatic is the smallest typebar typewriter ever made and the first typewriter with proportional spacing. Emery Hamilton married to Josephine Hamilton, they had no children. Towards the end of his life Hamilton lived in Flushing, New York, where he died at the age of 83 in 1921.